In the three years since My favorite head combinations, one of the first posts in this blog, I have had the opportunity to experiment with additional drum head combinations across four different drum kits. In this post, I will share my updated drum head recommendations, the result of dozens of additional hours of changing out heads, tuning them up, and then playing them in the rehearsal studio. Many of you have probably seen the illustration on the right from Modern Drummer magazine, which depicts various bearing edge profiles. Drum kits from the 1960s and 1970s were built with rounder bearing edge profiles. The "Vintage Roundover" edge pictured above was common on snare drums and rack toms, and it was not uncommon to see full roundover edges on floor toms and bass drums. Vintage roundover edges produce a warmer tone as the increased shell contact with the head reduces harmonic overtones ("brightness"), attack, and sustain. The shell plays a greater role in the overall tone of the drum. Conversely, "Standard" or "Double 45" degree edges produce a brighter tone as the reduced shell contact with the head increases harmonic overtones, attack, and sustain. These modern (1980s to present) 45-degree edges are cut more sharply, and with sharper bearing edges, the shell's role in the tone of the drum is reduced. We already knew that different types of drum heads can affect the tone of our drums, and now we know that bearing edges affect tone as well. So, that raises a question...how does the interplay between drum heads and bearing edges affect the overall tone of our drums? What combinations of heads and edges will produce the tone we are looking for? I currently have access to four acoustic drum kits, so I had the ability to do "head-to-head" (pun intended) comparisons between drums with modern Standard edges and drums with Vintage Roundover edges, and then cross-check the results on other kits with similar bearing edge profiles. These comparisons have been extremely useful in helping me to choose the most appropriate drum heads for the specific sound I want. 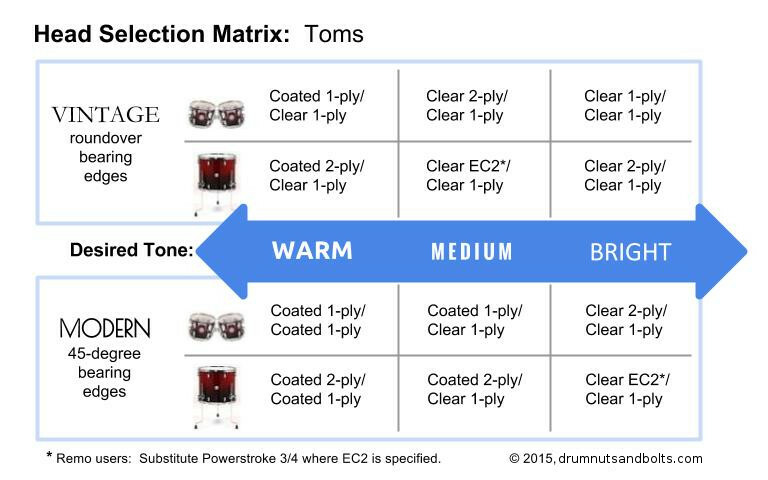 The following Head Selection Matrix summarizes my recommendations for toms. It's really two separate charts--the top half shows head combinations for toms with vintage/roundover edges, and the bottom half shows head combinations for toms with modern/45 degree edges. The desired tone ranges from warm to medium to bright as you move from left to right across the three columns. For each tom type (rack and floor), I list my batter head choice over my resonant head choice. So for example, if you have vintage/roundover edges and you want a "medium" tone, I recommend the middle column selections in the Vintage section of the matrix--clear 2-ply batters over clear 1-ply resos on your rack toms, and clear EC2 batters over clear 1-ply resos on your floor toms. Move to the right for a brighter tone, and to the left for a warmer tone. 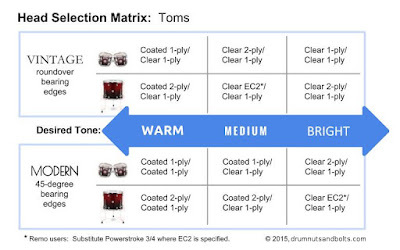 To achieve a "medium" tone with modern/45 degree edges, you would use the middle column selections in the Modern section of the matrix--coated 1-ply batters over clear 1-ply resos on your rack toms, and coated 2-ply batters over clear 1-ply resos on your floor toms. Note that the "medium" tone selections in the Vintage section of the matrix will result in a brighter tone on Modern edges. Note also that the "medium" tone selections in the Modern section of the matrix will result in a warmer tone on Vintage edges. Obviously there a dozen other types of drum heads that I haven't covered, and thousands of drummers out there with different needs and tastes. This matrix is not intended to be all things to all drummers...I'm just sharing what I've observed as I tried these combinations of heads and edges. Hopefully this serves as a useful resource as your strive to get the best tone out of your drums. As many of you know, the annual NAMM (National Association of Music Merchants) show is the premier showcase for the latest in music gear. 2015 NAMM did not disappoint! From January 22 through 25, 2015, nearly 96,000 people descended on the Anaheim Convention Center in Anaheim, California, to see, learn about, and experience the latest in music products. Attendance at NAMM is limited to music products industry merchants and their guests, and I was very fortunate to receive an artist's pass for this year's show from Stone Custom Drum, LLC, a Fort Wayne, Indiana, builder of quality drums in the American tradition. In a word--NAMM is overwhelming. With four levels of exhibit and meeting halls, over 6,000 booths, and tens of thousands of attendees checking out music gear, the atmosphere in the Anaheim Convention Center is a continuous crescendo. There were 526 merchants in the percussion category alone! Fortunately, NAMM provides a smartphone app to help attendees organize their plans of attack. Celebrity sightings are fairly common at NAMM. Many artists were scheduled to appear in exhibits for autograph and photo opps, as well as in-booth jam sessions. Steve Smith and Danny Carey were scheduled to appear in the Sonor booth. Among the many artists scheduled to appear in the Yamaha pavilion were Kenny Aronoff, Bobby Blotzer, Steve Gadd, Tommy Igoe, Dave Weckl, and Alan White. Endorsers for Pearl Drums appeared in its exhibit throughout the show, and Ludwig hosted artist autograph signing events. And Stewart Copeland and Dave Lombardo were on hand to demo new Paiste products--unfortunately in private press rooms. I was able to get close enough to shake hands with Tre Cool of Green Day in the SJC Custom Drums exhibit, and John Good of Drum Workshop just outside the DW pavilion. Aquarian, Avedis Zildjian, Ayotte Drums, Axis Percussion, Canopus Drums, Craviotto Drum, Crush Drums and Percussion, Ddrum, Dream Cymbals and Gongs, Drum Workshop, Dunnett Classic Drums, Evans Drumheads by D'Addario, Gretsch, Intellistage Stages, Istanbul Cymbals, KickPort, Ludwig Drum, Overtone Labs (makers of Tune-Bot), Pacific Drums and Percussion, Paiste, Pearl Drums, Pork Pie Percussion, Premier Drum, Mapex Drums, Meinl, Peace Drums, Promark, PureSound Percussion, Regal Tip, Remo, Roc-N-Soc, Roland, Sabian, Sakae Drums, SJC Custom Drums, SKB, Sonor, Soultone Cymbals, Stone Custom Drum, Tama Drums, Taye Drums, Trick Percussion Products, Truth Custom Drums, TRX Cymbal, Vater Percussion, Vic Firth, WorldMax, Yamaha Drums...and that's less than ten percent of the percussion-oriented merchants exhibiting at the show! Attending NAMM should be on the bucket lists of all music gearheads. I highly recommend it...just be ready for a five-alarm headache at the end of your first full day!